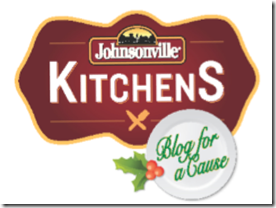 A few months ago, I had the privilege of going to my hometown of Milwaukee, WI to be part of Johnsonville Kitchen’s Blog for a Cause event (more about how your comment will equal $50 at the end.) 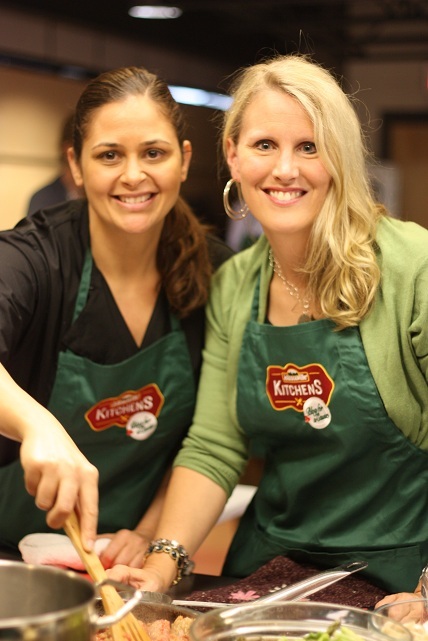 As one of the few family values, family owned food companies left around, Johnsonville is a company with which I am so proud to partner; not just because Johnsonville products are party of our family food culture , but also because they are a company committed to giving back to the community and causes in need. They brought a small group of bloggers to Wisconsin where we learned about Johnsonville, their mission and their desire to provide not just quality products, but also to get our opinion and input. Our traditional Christmas Day actually contained multiple Johnsonville products – My Quick Sausage Casserole, Scrambled Eggs with Spicy Sausage, and then for Christmas Dinner, my husband actually grilled brats and Italian Sausage because it was the Packer’s – Bears Game and it just wouldn’t have been right to eat anything else 🙂 Yes, by the end of the day, my guys were happy, I was over stuffed. Since Johnsonville has introduced their new chicken sausages, I have been buying those and just loving the quick and easy meal ideas. The highlight of this trip was their commitment to donate up to $1000 to the charity of my choice. Many of you remember the mission trip our family took to Guatemala this summer to work in an orphanage and open the eyes of our children to third world poverty. One of the families that worked at the orphanage decided to begin their own ministry: Redeemer’s House. 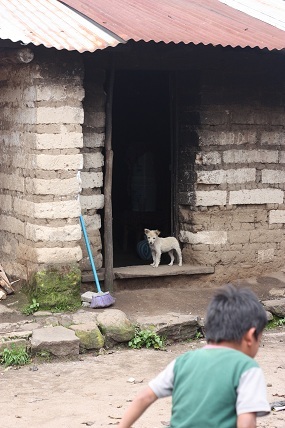 As they walk the streets, they are constantly immersed in the deeply rooted poverty on the streets and wanted to do something about it, one family at a time. They decided to get out into the community and search out single moms who are most in need – possibly living on the streets, without food or means to provide for their children. In the area where we were working, this was not difficult. All one needs to do is literally walk the streets. As they find these families, they are building relationships and helping give those women hope, and a means to dig out of the extreme poverty. Johnsonville has agreed to partner with me by donating up to $1000 to Redeemer’s House, but I need your help for them to receive it. They will donate $50 for every comment you leave sharing on of your favorite sausage recipes or one you’ve been wanting to try. Do you need some great recipe inspiration? You can head on over to their site and then come back and let me know in the comments. Even though Christmas just ended, we should never stop the giving in spirit, and Johnsonville will donate $50 for every comment left by 12/31. Thanks so much, my Tasty Tuesday readers, for helping out these precious blessings. So, for $50 to help families in Guatemala, what is your Favorite Sausage Recipe? If you have one posted on your blog, leave the link in the comments as well. What a great cause Jen! And sausage – yum! Our go-to sausage recipe is to brown sausages, then add frozen peppers & onions and cook until soft. Add in spaghetti sauce and simmer for about 10 minutes. Serve it over spaghetti noodles. So quick & easy – a great weeknight meal and tasty because of the sausages. I recently tried an amazing recipe with wild rice, kale and turkey sausage and want to make it soon! My husband is a meat fanatic! This is one of our favorite dips to make while watching sports. This is such a great cause. Way to go Johnsonville for going above and beyond! We like biscuits with a sausage patty, egg and sharp cheddar cheese on it! What an awesome cause! I am glad to be able to help out in a small way. 🙂 It has taken literally YEARS for me to finally perfect and understand how to my my MIL’s sausage balls. She gave me the recipe, but they never turned out right. Knowing something was off, I had her make them with me in my kitchen. Turned out I need to add water and I needed to roll them (and roll them and roll them) until they were tight balls. Bake 325 for 25 Min. I use Johnsville in my freezer sausage biscuits, but just whipped together a new dish I’m calling Pasta Lasagna (hope to post soon) that uses Italian sausage. I like to make a turkey sausage primavera. The sausage is browned, then cooked through. Zucchini, onions, bell peppers and a little garlic are sauteed before adding tomatoes and chicken broth. The sausage is added back in and the sauce is finished with parmesan and maybe a little cream. This is served over pasta. Even my pasta-disliking husband likes this one when we use veggies from the garden. Johnsonville makes fantastic products. Thanks for the opportunity ot help out in a small way! This is great! Our favorite recipe with using sausage is the overnight sausage and egg breakfast casserole. It’s our traditional Christmas breakfast! I hope you get lots of money for the Guatemalan project! I’m also sharing a fun appy idea for New Years Eve. One of my favorites is to use sausage in spaghetti sauce instead of ground beef. It adds a really nice extra zip. We love Johnsonville brats to! I LOVE AN EASY WAY TO GIVE TO THE LEAST OF THESE! THANK YOU!! I recently went gluten free and many Johnsonville sausage is gf! My newesKt simple recipe is white rice, velveeta cheese, goat chesse ( optional) and ground itialian sausage. Mix up and bake…yummo!! My whole fam likes it, its so easy and its gf for me…win win win! I add sausage to my chili – gives it great flavor! We love sausage cheese biscuits and grilling sausages and brats for games. That is wonderful! Great that you got to go, and even Greater that they will give to your favorite charity. For Christmas, I made a sausage and egg breakfast casserole. So easy and so yummy. I would LOVE to try risoto, too, but I fear the time involved would turn me off. and of course, sausage biscuits! I just made this breakfast sausage casserole for Christmas. Fry the bacon in a large skillet until nice and crisp. Add the minced onion and sausage pieces and cook for a minute or two. Transfer meat and onion to a soup pot; add lentils, bouillon, pepper, garlic powder, and bay leaves. Add water to soup pot to two or three inches above meat/lentil mixture, stir well. Bring to a slow boil and simmer, covered, for 1 hour. Add the potatoes and cook until potatoes are soft. Add vinegar, stir, and soup is ready to serve. Enjoy! Sausage browned in butter with periogies, onions, and whatever veggie I have on hand. Quick and easy skipper meal! combine and bake at 350 until golden on bottom. My dad and my husband are both on low carb diets, sausage in all its iterations are always on my grocery list 🙂 My husband made this up to take to a potluck at work. One of our favorite sausage dishes is this Super Fast Pasta recipe. We like it with pasta, sun dried tomatoes and sausage slices. What a blessing to be a part of this! I have a recipe that uses refrigerated French bread dough, sausage, pizza sauce and cheese – you spread out the dough, spread out the sauce, sausage and cheese and then roll it up and bake. Sure, it’s just pizza ingredients, but the dough is so much better than regular pizza, and eating it (especially while watching the Packers!) is less messy! My family loves a simple dish that just has sausage, potatoes, and onions in it. I brown the sliced sausage in a skillet and then remove to a plate to be kept warm. Add a little oil to the same skillet and add sliced potatoes and onions and cook down until tender. Add sausage back when almost completely done. Salt and pepper to taste. Simple one dish meal. I LOVE a good sausage pizza (homemade). What a generous donation! Go Johnsonville. I am all for blogging for a cause, as a matter of fact, that was how I started my blogging journey. I blogged to raise $ for charity for 1 1/2 years, and now, I am on my own trying to look for ways to contribute when I can. Fantastic that you’ve partnered with Johnsonville. I love gumbo with sliced sausage! We love Sausage Pinwheels – and they are so easy! Make a batch of your favourite buttery biscuits and roll them out into a large rectangle that is about 12×18″ and about 1/2″ thick. Spread 1 pound of uncooked Johnsonville breakfast sausage over the biscuit dough and sprinkle it with 1/4 tsp cayenne pepper and 2 Tbsp. pure maple syrup. Roll the dough up starting at the long edge into a nice fat log – slice into 1/2″ thick slices and place on parchment lined cookie sheet. Chill for 15 minutes. Bake ate 425 degrees for 15-20 minutes. Makes about 36 cute and tasty pinwheels. Thank you Johnsonville for supporting Jen’s friends in Guatemala! I love to make casseroles with the new chicken sausages. Quick, easy and delicious! This household uses Johnsonville Italian sausage for EVERY Italian meal involving sausage! Our favorite way is to roast them in the oven, then serve alongside pasta with a simple marinara sauce – delicious! Although we can’t get Johnsonville sausages in England, I’m sure they would be delicious in this recipe, especially their new chicken variety. Thank you for hosting, and Happy Holidays! Today I posted a low sugar shortbread recipe. Perfect for kids when you don’t want them to have that sugar high! I hope it’s ok to leave more than one sausage recipe!! One of my favorite muffins is our Savory Sausage Breakfast Muffins! Hope the link works. And hope you raise tons of money for Guatemala! My stepmom loves Johnsonville turkey sausage she found in the midwest, but I haven’t found it here yet. We like to open the casings and crumble it in a pan to cook to put the sausage on pizza. I’ve actually been wanting to try your quick sausage casserole. Glad Johnsonville is still in the giving spirit. I love adding link sausage to my pinto beans with lots of chili powder and salt! Serve with cornbread. Honestly, I never go out of my way to buy Johnsonville and usually buy whatever is on sale but now I will purposely look for Johnsonville! Blessings! sausage in my file gumbo recipe, johnsonville rocks! What a great cause, Jen! I am eager to try the recipe for Italian Pasta Stew with Johnstonville Mild Italian sausage links. It woud be perfect for church dinners this winter. Thanks for all the great Johnstonville recipes. Our favorite way is in a sausage and egg casserole with cheese and veggies. Easy and delicious. I buy Johnsonville sausages in my Phoenix grocery store. Now that I know what kind of company they are, I’ll have to buy more of them. 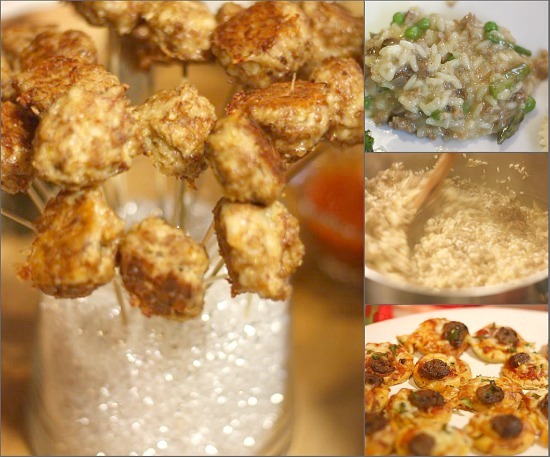 The recipe that looks really good to me is Chipotle Monterrey Jack Cheese Chicken Sausage and Lime Kabobs. My mouth is already watering! I hope you get lots of comments for such a worthy cause. Im pretty sure sausage is my favorite meat ever.. really. Whats not to like about it? I never met a sausage I didnt like and I’ve tried lots of varieties from many different ethnic backgrounds. My own most go-to recipe for sausage is to mix about a half bottle of commercial Italian salad dressing with a couple pounds of Italian sausage, mix in about a cup of Pecorino Romano or grated parmesan cheese and stuff Italian peppers or jalapenos with this mixture, let sit 3 or 4 hours (or overnight) then grill. We do it on the grill in the summer & broil them during the winter. Either way, they’re delightful! I like recipes with sauteed or fried summer sausage! My sister makes a taco with summer sausage, tomatoes, and I think cilatro or onions, maybe cheese. Hi, this is a great cause! I like to fix a quick and easy sausage and rice dish. I heat chili beans or some kind of beans with a little seasoning and plain rice, then I heat some smoked sausage(cut into small pieces) in a little water in a skillet until hot. Sometimes I mix it all together and sometimes I serve each thing separately so everyone can mix to their own tastes. I use a package of smoked cooked sausage – brats or kielbasa – sliced in one inch chunks and saute in the same skillet with a package of frozen pierogies. Add a salad and dinner in 10 minutes! This is amazing!! Honestly, whenever I have a recipe that seems kind of bland, I add sausage. One of my favorites is sausage, arugula, and pasta–I just toss it with a little olive oil, garlic, and parmesan. Yum! My daughter was chef here for Thanksgiving. So no exact recipe (I wasn’t in the kitchen) but I know she used chicken sausage apple, rosemary, pre-made cornmeal sausage, followed the directions on the bag. My MIL only eats poultry and fish so until chicken sausage, that was not in our stuffing. Thanks, Johnsonville, for new sausages and for your generosity. Instead of beating my head against a wall trying to figure out what gift to give someone who is so blessed, as most of us Americans are, I gave to Word Vision and got my meager gifts multiplied 11X!!! And no one receiving these gifts was disappointed. Keep up the good work. We love sausage gravy over super-quick homemade biscuits. I add a fruit salad and grits (yes, we live in the South) for an easy supper and great leftovers for breakfast. Optional: Grilled (Caramelized) onions and/or mushrooms. YUM! To make the roux: In a medium skillet, melt 3 tablespoons of butter over low heat. Add the olive oil. Using a wooden spoon, stir in the flour. Cook, stirring, until the mixture thickens and pulls from the sides of the pan. Remove the roux from the heat before it browns. To make the filling: In a large skillet, melt 3 tablespoons of butter over medium heat. Add the onion and cook, stirring frequently, until the onion is soft, about 15 minutes. Add the roux to the onions then add 1 cup of stock. Simmer the stock, stirring constantly, until it thickens, about 5 minutes. Add the parsley, chives, paprika and sun-dried tomatoes. Allow the sauce to return to a simmer, then stir in the sour cream. Reduce the heat to medium-low and simmer gently, stirring frequently, until the sauce reduces slightly. Set aside to cool. Meanwhile, brown the sausage. Break into small pieces, and add the remaining 2 cups of chicken stock, cover the skillet and cook over medium heat until cooked through, about 15 minutes. Uncover the skillet, raise the heat and simmer the sausage until the stock has evaporated. Allow the sausage to cool, then add it to the cooled sauce. Refrigerate the filling until ready to use. What a GREAT cause for a hop!!! I’ve linked up my Braised Italian Sausage with Vegetables recipe to the hop or you can find it at http://mjskitchen.com/2011/03/braised-sausage-veggies/. Great post! I love this recipe (I have used both kielbasa and Italian sausage) and your cause sounds wonderful. Love this idea, and didn’t know how committed Johnsonville is to giving back. They will definitely get more of my support! I make a potato and sausage that is easy and my children love, but have been wanting to try it with chicken sausage, so will be looking for the Johnsonville chicken sausage the next time I’m shopping! I love Johnsonville brats! Cooked in beer and with saurkraut on top, they’re delicious. I’d also like to try some of the recipes shared here and the Spicy Cracked Black Pepper Brats from the Johnsonville site. This is my new favorite sausage recipe. It is made with Chorizo sausage by Johnsonville which I am thrilled to find here in PA. since I have been hooked on Johnsonville sausage since we lived in WI for 13 years. Cut up a package of chorizo (I like it fairly fine) and brown it with a chopped onion and near the end 2 or 3 smashed garlic cloves. Add diced potatoes I used 4 or 5 large baking size. and six cups of water with bouillion cubes to make broth. Also add a couple of good size bay leaves. as potatoes get tender add about 8 cups chopped kale and a can of drained garbanzo beans. Simmer for about 1/2 hr or until you can’t wait any longer. This is delicious. If you have young children or tender palates you could make this with regular brats but the chorizo is delicious and makes the broth yummy. Make the lemon mayonnaise by combining mayonnaise, lemon juice, red wine vinegar and red pepper flakes. Set aside to allow for flavors to combine. In a skillet on high heat, toast the prosciutto slices for 2 minutes on each side until they are brown. Remove from pan and place on paper towel to drain. Heat the grill to medium-high. Place patties on the grill. Grill red onion slices until grill marks appear, about 7 minutes on each side. Then toast buns. When burgers are done, top with fresh mozzarella cheese and heat until melted and set aside. Put burger together by coating both sides of the bun with lemon mayonnaise, then topping with tomato, onion, lettuce, crispy prosciutto, several fresh basil leaves and the mozzarella/basil covered burger. YUM!! I’d like one of these right now! 🙂 Thanks for sharing it! This is awesome! We are missionaries in Mexico I think it’s so great when people can experience a new culture. So glad you will be able to help the people of Guatemala. I have a house full of teenage boys, and one of their favorite meals is breakfast burritos! We brown a pound of sausage, cook a few pounds of hash browns, and finish up with a dozen eggs. A little of each stacked in a tortilla shell with some cheddar cheese and salsa is the best! We like chicken sausage in our stuffing or just cooked on the grill in the summer. We eat a LOT of smoked sausage in our family! I love how easy dinner is to make with sausage and my go-to recipe is super easy. Just brown smoked sausage, add green italian beans (drained), and either stewed tomatoes or diced tomatoes. Simmer for about 5-10 minutes. In the meantime, cook rotini pasta according to given directions. Drain and add cooked noodles to sausage mixture. Top with parmesan cheese and your done! I found this great recipe for Spicy Sausage Wontons. Made them this weekend and they are amazing! brown sausage. Drain. Combine sausage, peppers, onion, garlic, carrots, and cheese in a bowl. Set aside. Place wonton wraps in mini muffin cups. Combine melted butter and garlic powder, brush on edges of wraps. Bake at 350 for 7-9 minutes. Put sausage mixture in wontons, bake at 350 for 5-7 minutes. Enjoy! There was enough filling for 60 wontons. Our family favorite is a sausage, bread, egg and cheese casserole with cream of mushroom soup. It is the perfect New Years Day brunch item since it is made the night before and cooked the next morning.